The Rose Electronics CrystalView Mini (CRK-M2P/AUD) consists of a local unit that connects to a PC, server, or KVM switch and a remote unit that connects to a keyboard, monitor, and mouse, or KVM switch. The local and remote units are connected together with up to 150 feet of standard CAT5 cable. 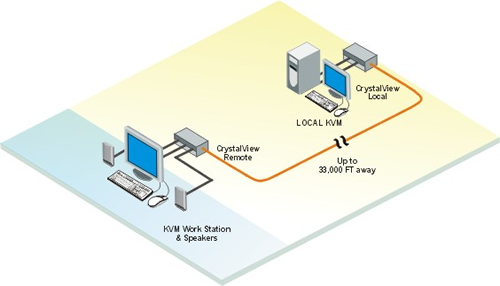 The ideal way to apply the CrystalView Mini is to connect the Local unit to a Rose Electronics KVM switch. Expanding the switch allows access to 1,000 computers or servers. The Rose KVM switch can be connected between the Local unit and computers, the KVM station and the remote unit, or both. Installing the CRK-M2P/AUD is as easy as connecting the KVM station to the remote unit, a computer to the local unit, and connecting the local and remote units together with CAT5 cable. The CrystalView Mini uses a microprocessor to emulate the keyboard and mouse. This means that the keyboard and mouse on the remote unit does not have to be connected for the PC to boot. Only the Local unit must be connected to the PC.